Thanks for stopping by! 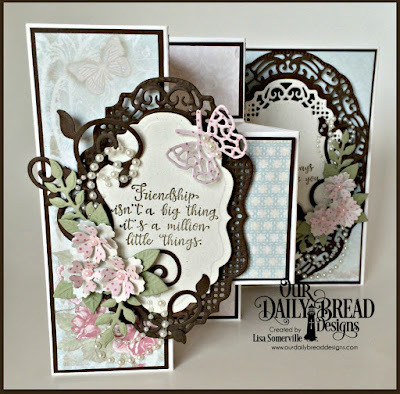 Today members of Our Daily Bread Designs Design Team are sharing new projects created with the July Release. My card uses the Forever Friends and Vintage Borders die set from the July release along with some additional ODBD Custom Dies, a Fun and Fancy Fold Card Kit (Tri-Fold Shutter) that will be available SOON on our Daily Bread Designs website and the beautiful Shabby Rose Paper Collection. (See product links below). What a pretty design for a card! Love that fold!! Beautiful little flowers and butterfly plus I love the Vintage Borders framing!! This is gorgeous Lisa! Love the combination of papers and dies! Fantastic! Wow, this is beautiful Lisa! A beautiful message on a beautifully designed card, Lisa! Love the fold, the colors, and the pretty papers…a gorgeous creation, indeed! Hugs! Oh Lisa, This card is so beautiful. I love everything about it from the color choices to the sweet flowers and the beautiful butterfly. Gorgeous my friend. (((Hugs))), Diane. Beautiful, Lisa! Love that fun fold! !